We just returned from another successful EuroBSDCon, which was held in Stockholm, Sweden, October 3-4. There were around 250 attendees from around the world, representing the major BSDs. The Foundation was proud to be a Platinum Sponsor for the conference. The FreeBSD Developer Summit was held two days prior the conference. The developer summit was very productive and successful. Foundation board member, Benedict Reuschling helped organize the summit. Init AB, sponsored the whole event. We had over 60 people attend. There were many great sessions and smaller groups working together. In fact, Deb ran a session on Recruiting to FreeBSD. 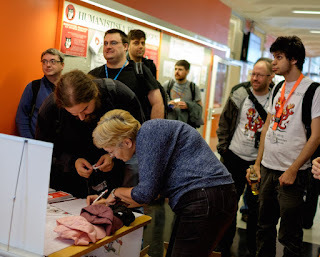 We had 28 people attend this session, and almost everyone in the room contributed to the discussion on what we, as a Project, need to do to attract more people to FreeBSD. There were a lot of great suggestions, and the Foundation will be working with the Project to continue this momentum of making some positive changes, helping us to move forward and grow. As usual, we had a table at the conference for taking donations, handing out swag, and talking to people about the work they are doing and where we can help with. 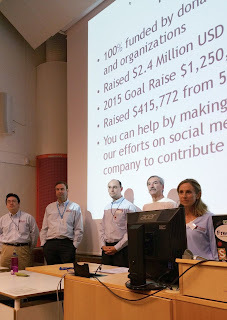 We also talked to a few companies about making donations, as well as, providing testimonials. We accomplish so much when we attend these conferences, because we have the opportunity of talking and working with people face-to-face. We know it's the same for the attendees. During the day, people attend different talks on subjects that interest them. At night, everyone hangs out in the hacker lounge socializing, but mostly working together solving problems. It's pretty amazing to watch the collaboration going on. From the Foundation, we had Dru Lavigne, Deb Goodkin, Kirk McKusick, Erwin Lansing, Ed Maste, Hiroki Sato, and Edward Napierala attend the conference. Deb and Ed gave a presentation on how the Foundation supports a BSD project. Kirk gave a presentation on "a Brief History of the BSD Fast File System," and he taught the two-day tutorial "Introduction to the FreeBSD Open-Source Operating System." We had over 70 people stop by our table to make a donation. NetGate generously donated a NetGate RCC-VE 4860, which is a low-cost, low-power modern communications platform. Michael Dexter was the lucky winner! Dr. Colin Percival: For his contributions as FreeBSD Security Officer 8/2005 - 5/2012, tools he authored that are used daily by thousands of FreeBSD users to keep systems up to date (FreeBSD Update and Portsnap), and his efforts in having FreeBSD supported on Amazon's EC2. Michael Dexter: For his FreeBSD advocacy work and support of bhyve and Xen into FreeBSD, and for advocating for FreeBSD at the many conferences he's attended and presented at outside the usual BSD ones. 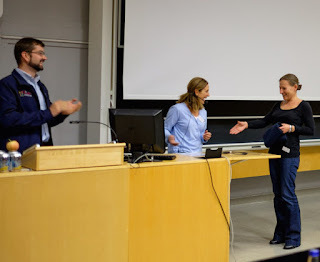 Shteryana Shopova: For her development work on the SNMP agent, as a GSoC mentor, and organizer of major BSD conferences. Allan Jude: For his advocacy of FreeBSD and BSDNow which highlights work being done in the FreeBSD and other BSD Projects. 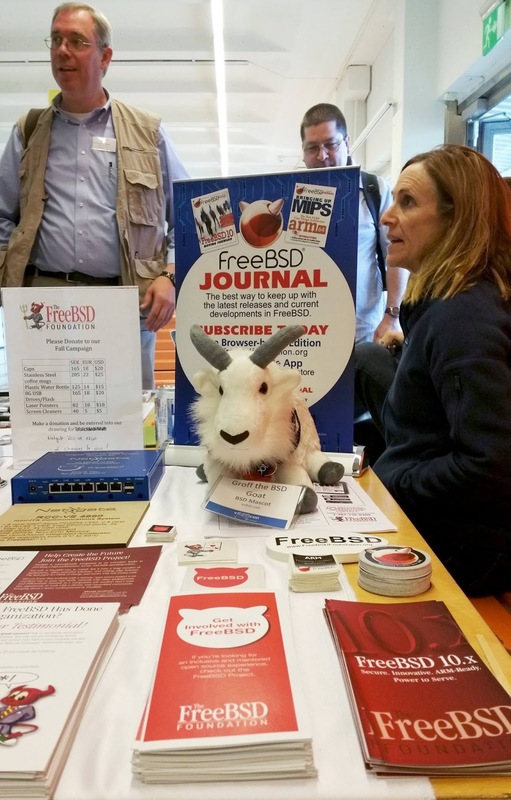 Many people have joined FreeBSD because of this program. He has also contributed to ZFS advocacy, documentation, and polishing the FreeBSD end-user experience. Paul Shenkeveld (Posthumous): For his commitment to the BSDs by co-founding and chairing the EuroBSDCon Foundation in 2011 and being one of the biggest BSD advocates, including running his own consultancy company that supported FreeBSD for 25 years. We look forward to EuroBSDCon 2016 in Belgrade, Serbia!